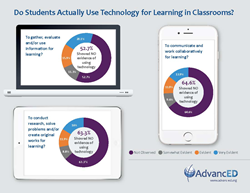 In more than half of classrooms, AdvancED® study shows no evidence students are using technology to gather, evaluate or use information for learning; two-thirds of classrooms show no evidence of students using technology to solve problems, conduct research or to work collaboratively in education. Do Students Actually Use Technology in Classrooms? It is when students lose themselves in their learning that we have accomplished what we set out to do for them in the first place, said Dr. Ludwig van Broekhuizen, chief innovation officer for AdvancED. Based on direct classroom observations of 140,000 classrooms in K-12 schools across 39 states and 11 countries, a new study by the school improvement organization AdvancED® found there are still relatively few classrooms in which the use of digital tools and technology is a regular part of a student’s school experience. Click here for an infographic of the study’s findings on students’ use of technology for learning. While numerous surveys suggest that the pervasive use of tablets, smartphones, laptops, and digital education content in the classroom is expanding and changing the role of teachers, the AdvancED study found little evidence of technology being used by students to strengthen learning in classrooms today. More than half (52.7 percent) of all classes showed no evidence of using technology to gather, evaluate, or use information for learning. The study looked at data gathered in 20-minute observation periods during which specially trained observers conducted student-centered classroom observations in randomly selected classrooms, lessons, and schools at the beginning, middle, and end of class. AdvancED also found that about two-thirds of classrooms showed no evidence of using technology to conduct research, solve problems, or create original work (63.3 percent no evidence) nor to communicate and work collaboratively for learning (64.6 percent no evidence). AdvancED research data of the extent to which students are actually using technology for learning—show that even as more sophisticated technology tools have become commonplace in schools, they are still doing little to change how students learn on a day-to-day basis. AdvancED findings come from an analysis of three years of data from its learning observation environments observation tool (eleot) ®, which measures and quantifies active student engagement through learner-centric classroom observations, to determine how extensively technology is being used to engage students in learning. Instead of just indicating the mere presence of technology in the classroom, an analysis of eleot observations was conducted to determine how extensively technology is being used as part of efforts to engage students in learning. The study’s findings present educators and the community at large with an opportunity not only to use technology more effectively for learning but also to measure student engagement, find ways to enhance curriculum relevance and interact with students differently. AdvancED is a non-profit, non-partisan organization that conducts rigorous, on-site school external reviews of Pre-K through 12 schools and school systems to help educators and their communities ensure that all learners realize their full potential. While their expertise is grounded in more than a hundred years of work in accreditation, AdvancED is also committed to help schools improve. Combining the knowledge and expertise of a research institute, the skills of a management consulting firm and the passion of a grassroots movement for educational change, we serve as a trusted partner to over 34,000 schools and school systems—employing more than four million educators and enrolling more than 20 million students—across the United States and 71 other nations.